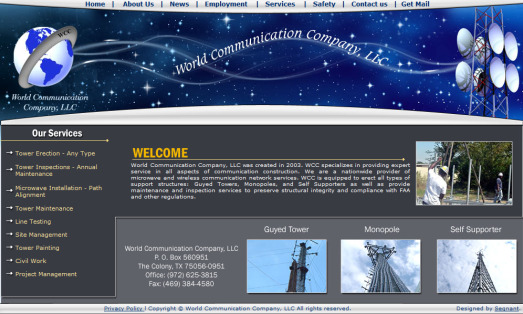 World Communication Company, LLC specializes in providing expert service in all aspects of communication construction and is a nationwide provider of microwave and wireless communication network services. 1. Services page: This page displays not only information about the services but a dynamic photo slideshow as well. 2. Contact Us page: Users can view the company's current address and contact information in addition to being able to fill out an online form. 3. Get Mail page: Employees are able to access the webmail interface directly from the company website. Segnant has helped to create a stylish but easy-to-manage website.